Oil on panel. 103 x 170 cm. 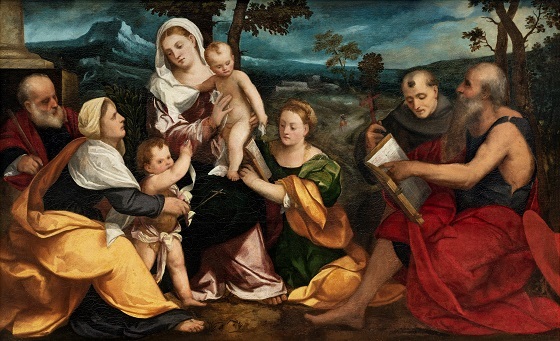 The rest during the flight into Egypt is portrayed here as a meeting between the Virgin Mary, her older relative Elizabeth and their children, Jesus and St John the Baptist. The Virgin Mary sits elevated above the other figures. The holy group is accompanied by Joseph and the saints Katharina, Francis of Assisi and the church father Jerome. The light shines strongly upon their yellow and white cloaks, but the viewer’s gaze is also drawn towards the bluish dusk behind the figures. The slightly washed-out contours and the saturated colours are characteristic of the Venetian school, to which Bonifazio belonged. The Madonna and Child with saints in rural surroundings is a dominating motif in Bonifazio Veronese’s art. Around sixty works of this type have been attributed to him and his workshop. Bonifazio came to Venice at a young age, where he founded a large and successful workshop. His students include Tintoretto and Jacopo Bassano, two of Venetian Mannerism’s greatest masters. Bonifacio’s art writes itself into in the mature Classicism of the High Renaissance. His paintings are highly influenced by great Venetian masters such as Giorgione and Titian. The subjects are religious, the compositions often relief-like and his figures characterised by their small, round heads and splendid dress in warm, subdued colours.